How was your long weekend? It’s always the 3rd day that does our family in – Monday just seems to drag on forever! But we made it to Tuesday and back to school (whew). And after last week’s 25 ways to update your jeans for fall we got a little craft happy with an old pair headed to the denim graveyard. 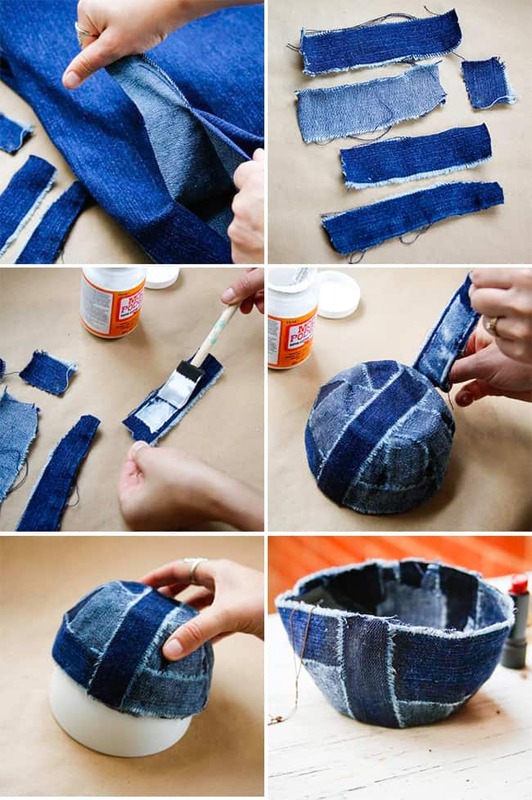 Here’s a fun and simple way to give old jeans a new life. These bowls make perfect catch-alls around the house – and wouldn’t they be a perfect gift for a guy? Start by ripping strips of denim about 4 to 5 inches long and a couple of inches wide. Being precise isn’t necessary so there’s no need to measure. But you do want to rip instead of cutting to get the frayed edge. Once you have a few strips cut, generously brush on Mod Podge and start layering them around the bowl shape. Turn some pieces inside out to get a color variance and add some strips vertically and some horizontally for the patchwork effect. Keep adding strips until the bowl is well covered. Once the Mod Podge is dry, remove the bowl from the base and it’s ready to use. If the Mod Podge is taking forever to dry or just doesn’t seem to be getting hard, stick the bowl in the oven at a low temperature and let it bake for 10-15 minutes. 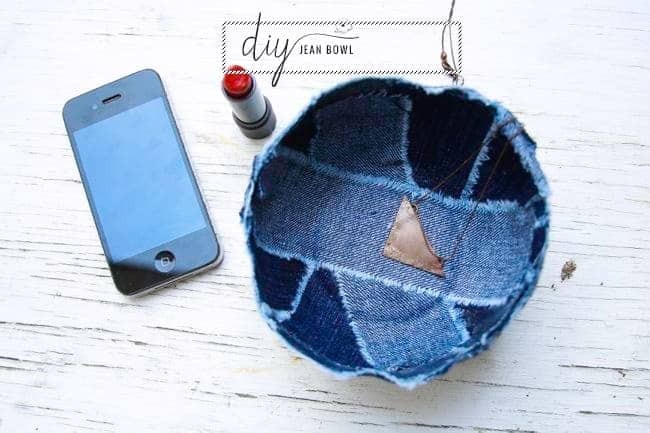 Another helpful tip: You don’t need to worry about the jeans sticking to the bowl base. Once dry, it comes off easily. We tried putting a layer of parchment paper between the bowl used for shaping and the jean strips on our first attempt, and it will be impossible to get the paper off the jeans! Do you have any outdated jeans you can’t bear to get rid of? Come on, I know there’s some acid wash hiding out there somewhere! And if you want to “pretty up” the rim… you can mod podge lace just inside the bowl’s lip to just outside the lip… leaving a little ruffle “free” on outside. White ruffled lace would be gorgeous with the denim! So I tried this with the half elmers glue and water recipe… It did not slip of the bowl. I broke one of my knives trying to get it off it was stuck on so well. What did I do wrong? Your bowl looks beautiful! Love your blog here too, having a great little visit!! I have this post linked to my denim DIY post too today! Should you modge podge the inside as well, once its dry? I wounder if you would get the same result with liquid starch? I’d love to know if the liquid startch works! here in Italy we don’t have Mod Podge, any ideas of alternative glue I could use? Homemade Modge Podge: Equal parts of Elmer’s glue (the stuff that dries clear) and water. Pour each into a jar with a lid and shake it REALLY well. They are best used for decoration – if you get them wet the glue will get soggy and they will probably start to fall apart. Does it matter what kind of bowl you use so the modge podge won’t stick? No, once it’s dry, it pops right off – the mod podge didn’t stick to the bowl at all. I LOVE ALL your ideas!! This is the best dyi/craft site ! Where do you get all your brilliant ideas? I really really like the no sew, easy, and quick crafts. It looks like I’ve spent endless hours sewing and slaving over all the great crafts and jewerly that I have made..but I hav’ent…That will be our little secret. Thank you so much for all the ideas. I will do this with kids- art class! That sounds like a perfect art project! Have fun!! what a great idea, I’ve got loads of old pairs of jeans hanging around waiting for the right moment! I always feel bad throwing away old jeans! This is a great idea for recycling them. We would love to have you share this our Saturday Link Party. It starts Fridays at 6pm, hope to see you there! so GROOVEY! a good place to collect pocket change and keys! 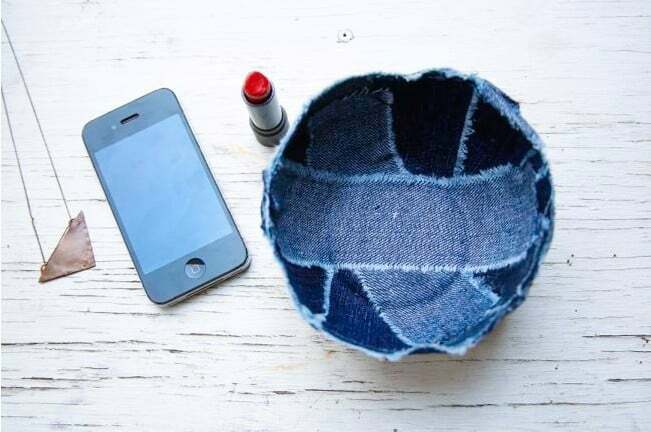 Great use for old jeans! Now this is clever! I bet the kiddos would enjoy this craft too. It’s such a good idea ! Thank you ! Brilliant once again! I love this idea, and it’s such a great way to reuse the kids old, ripped, too small jeans! This is perfect since summer is over, i’m sure a lot of us are left with scraps of jeans from the turning our jean pants to shorts!